Just around the corner is March 1st, time for spring flowers, warmer temperatures and bacon. Yes, crisp, juicy bacon.March 1st is National Pig Day. Started in 1972 by Texas art teacher Ellen Stanley, this holiday honors and gives thanks to pigs. For some of us, the word “pig” conjures up images of Charlotte’s Web’s Wilbur or Babe the gallant pig. For others, it’s mud wallowing, curly tails and snorting sounds, but on this holiday and everyday, the American Livestock Breeds Conservancy (ALBC), in Pittsboro, NC, and farmers around the country are working hard to save rare breeds of pigs from extinction. Modern agriculture has made it difficult for these breeds to survive. In 2009, seven breeds of pigs were listed on the ALBC Conservation Priority List as critically endangered meaning less than 200 of these animals are registered in the US. By favoring a few highly specialized breeds selected for maximum output, modern agriculture has made many heritage breeds “outcasts” because they cannot survive under modern agricultural pressures. 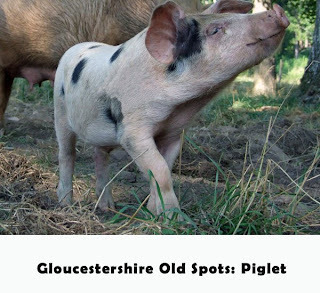 Each rare breed pig is a remnant of our cultural and agricultural heritage, but more importantly, they are critical for the continued existence and future adaptation of livestock. So, on this holiday, - bringing home the bacon takes on a whole new meaning. While it may seem counterintuitive to eat a rare breed to save it, it’s one of the critical components of rescuing these breeds. Without a market for these animals, farmers have no incentive to raise them. 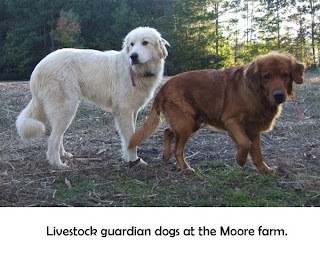 The more demand in the marketplace, the more farmers are willing to raise these breeds. Just last month, Ayrshire Farms in Upperville, VA, hosted a “Pig Pageant” where rare breed hogs were served to a crowd of journalists and invitees in hopes of raising awareness for these rare breeds. 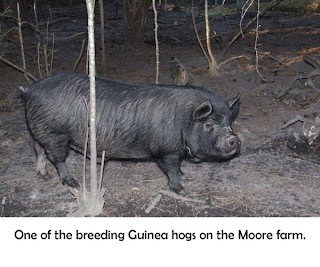 ALBC is also making strides to raise awareness and production of rare pigs. in the hopes of raising awareness for all rare breeds. So, on this National Pig Day, do a little something to make this rare pig-tale have a happy ending. How can you help save a rare breed hog on National Pig Day? 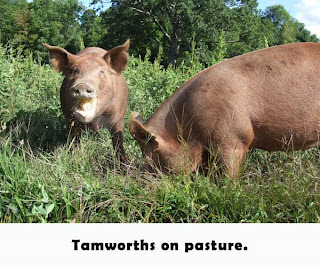 -Visit a local farm that raises rare breed pigs to learn more about the breed. 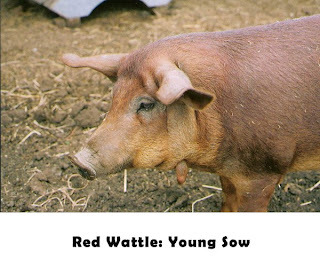 -Eat at a restaurant that serves rare breed hogs. -Have a BBQ or pork party and take up donations to send to one of the organizations helping to save rare breed pigs. On a bright and sunny morning we found ourselves at the steps of the historic Honey Horn Plantation which has recently become the new site of the Coastal Discovery Museum. 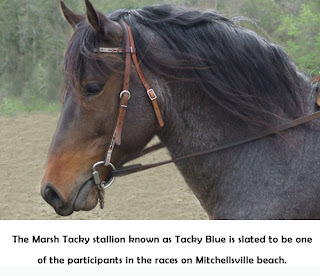 Because the Marsh Tacky horse was historically kept at the plantation and by the local islanders, known as Gullahs, the museum has been interested in supporting ALBC efforts to conserve the breed. ALBC was invited to provide input for an event involving the horses as part of a month long cultural festival in February of 2009. 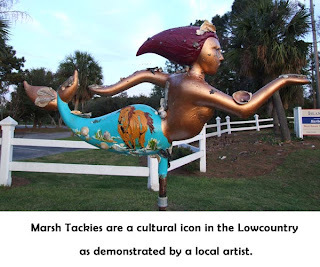 The museum and festival organizers decided to bring back the Gullah tradition of beach races with Marsh Tackies as part of the festivities. 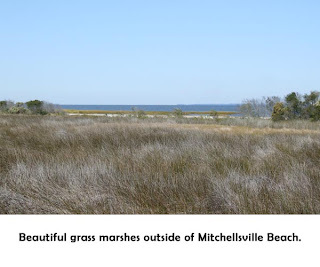 After much discussion between city organizers, museum management, festival coordinators, and horse owners at the meeting, it was decided that the race would be possible and will be held on the historic Mitchelsville Beach on February 22. There is much excitement about the races and the event is expected to be a huge public draw for festival attendees. Following the meeting on Hilton Head, Liz and Jeannette left the island and made their way four hours inland to Anderson, SC, in order to attend the start of the Carolina Farm Stewardship Conference (CFSA). During the opening banquet that evening, ALBC was astonished to be awarded the Non-Profit of the year award by CFSA. It was a nice surprise and an unexpected honor for the organization and we were pleased to have been able to accept the award on behalf of the office. The day began with an early morning speaking engagement at the CFSA conference. Jeannette presented a three hour lecture and workshop on rare breed genetics and conservation during the event. The talk was well received and helped to motivate attendees to incorporate more rare breeds on their farms. Following the conference it was time to go home to North Carolina. We headed back and made it home to Pittsboro before nightfall. It seemed only appropriate (and very much appreciated) that Jeannette’s husband Fred had prepared a Buckeye chicken for dinner to welcome us back. Although hectic, the trip was very productive and well worth the effort. 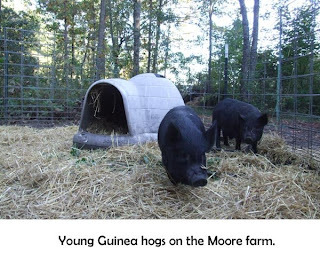 There are a lot of exciting projects in process in South Carolina and ALBC’s partners in the state can be proud of their continued efforts with rare breeds in the region. 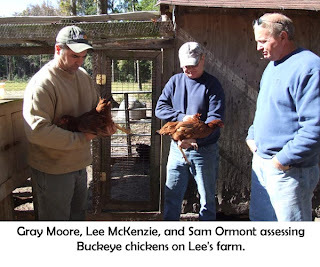 Jeannette and Liz were joined by Gray and another poultry breeder, Sam Ormont, as they continued into the heart of the Lowcountry to meet with Buckeye producer, Lee McKenzie. Together the group went through a training session lead by Jeannette and using Lee’s flock of Buckeyes. 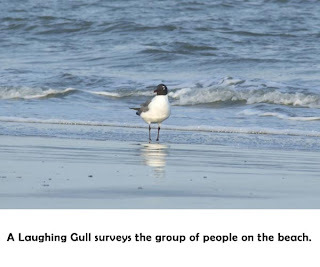 The group reviewed the process of selecting breeders for productivity and collectively picked out the best candidates for the 2009 breeding season. (You can learn about this process by visiting the ALBC website’s Educational Resources page for the Chicken Assessment to Improve Productivity) Following the flock assessment, the group of poultry producers moved to discuss the possibilities of forming a co-op to support a small network of breeders and hatcheries. Before leaving the farm, we all had the opportunity to see Lee’s prized herd of Marsh Tackies. 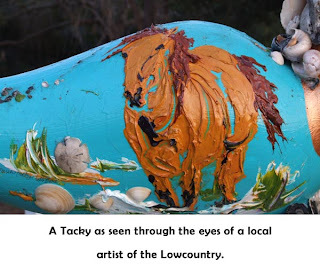 Lee is a long time breeder of these horses that are rarely found outside of the Lowcountry. 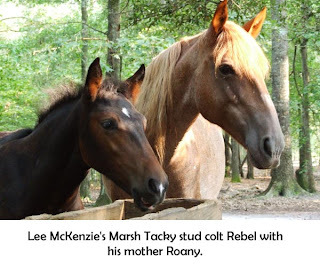 Lee’s pride and joy is his young stud horse, Rebel, who is an up and coming stallion that he will begin to incorporate into his breeding program in 2009. Rebel’s breeding was very carefully planned and represents years of understanding of the breed in order to bring out the best of what they represent. 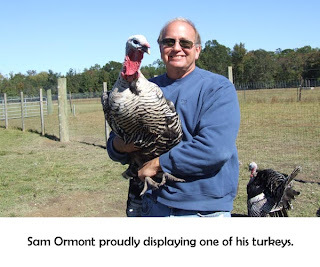 We said our goodbyes to Lee and the rest of the group and headed to Sam Ormont’s poultry farm to plan an ALBC sponsored turkey husbandry workshop that will be held on the farm on February 21 & 22. 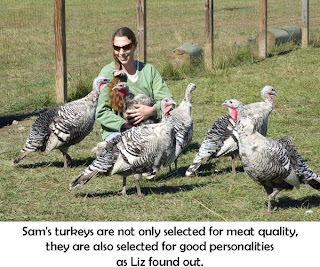 As we arrived we were greeted by 100+ turkeys that have been selected for productivity and personality, making them a good fit for Sam’s breeding program. 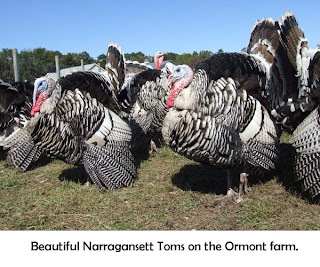 All of the birds were impeccably kept and it was clear the site will set an excellent example for people wanting to learn more about raising turkeys. Following the visit to the Ormont farm, Jeannette, Liz, and Gray made one more stop that day to the plantation of ALBC Board of Directors member, Landon Thorne. 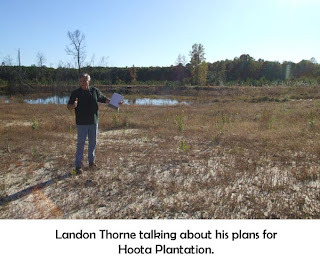 The 110+ acre Hoota Plantation (named after the Lowcountry slang word for “owl”) is a project that Mr. Thorne has been working on to set an example and promote organic production in his region of the state. Landon needed advice on how to incorporate rare breed poultry and cattle into his project and asked that we stop by and meet with him while we were traveling in the area. 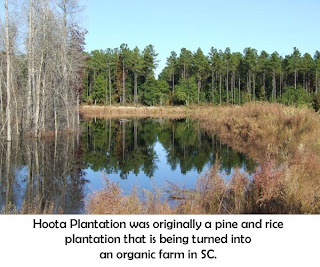 The habitat we viewed on Hoota Plantation offered a wide range of grazing opportunities for chickens and small herd of Pineywoods cattle, a breed that was once widespread in South Carolina in Colonial times. We all thought that the most logical choice for a chicken breed would be the Dominique since historically, they too were widely used in the area. 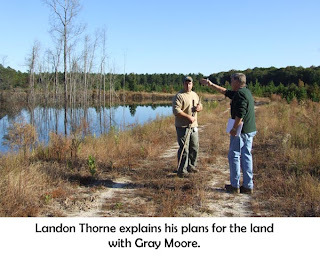 Landon’s idea of bringing the breeds back into the Lowcountry is one with promise and a good chance of success as he carefully plans the incorporation of the breeds into the overall land management strategy on his farm. The day ended with Jeannette and Liz saying goodbye to Landon and Gray and making their way to the next destination, Hilton Head Island. 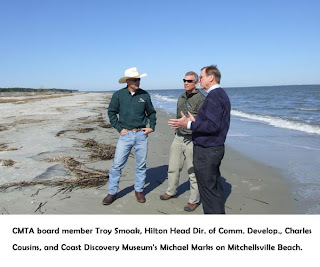 In late October 2008, a trip was planned for coastal region known as the “Lowcountry” of South Carolina to accomplish several conservation goals within that region. Joined by ALBC member and supporter Elizabeth Gordon, Research & Technical Programs Manager, Jeannette Beranger, hit the road with Liz and a breeding flock of Buckeye chickens hitching a ride to their new home in Pamplico, SC. The Buckeyes were bred through a recovery project initiated by ALBC in 2005 and were going to a new breeder that will be starting a small regional hatchery to provide chicks for local producers. 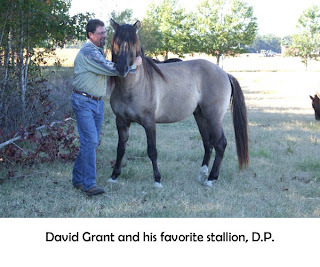 Along the way to Pamplico, a brief visit was made to the farm of Marsh Tacky horse breeder, David Grant. David is an avid hunter and uses nothing other than Tackies as mounts and spends much of his time telling people about the breed. 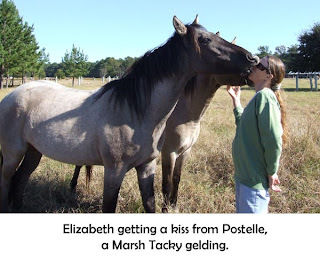 His excitement for Tackies is infectious as Liz soon discovered when surrounded by his curious and gentle horses. Liz left the farm smitten, as we continued along our way to the next stop which was literally…for the birds. Jeannette and Liz arrived at Carolina Heritage Farms belonging to ALBC member Gray Moore and his family. 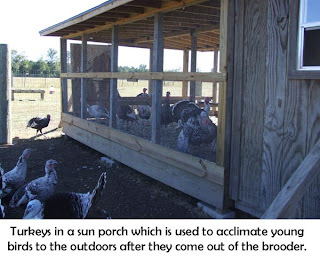 Gray has been slowly developing a small regional hatchery at his farm and has had success in marketing heritage breeds chicks and poults locally. 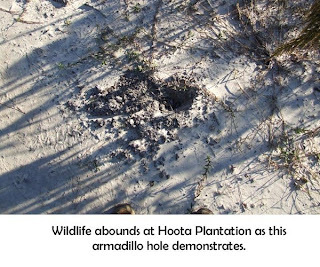 The newly arrived Buckeyes will provide hatching eggs for the 2009 breeding season that will aid continued efforts to recover the breed in South Carolina. While at the farm, we were treated to a visit with Gray’s flock of Narragansett turkeys and a small herd of rare Guinea hogs. Gray is following in his father’s footsteps with an interest in swine. 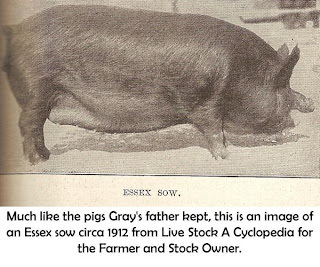 His father had a long history with similar hogs, known as Essex, which he kept on small Carolinian islands in the 1940’s. 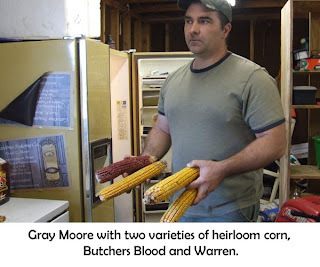 Gray’s well-nourished pigs were supplemented with the fruits of his other interest which is heirloom corn propagation that includes over 20 varieties on the farm.